Yesterday Solomon and Nicole were supposed to be married. But that was not meant to be, due to Solomon’s death in January. 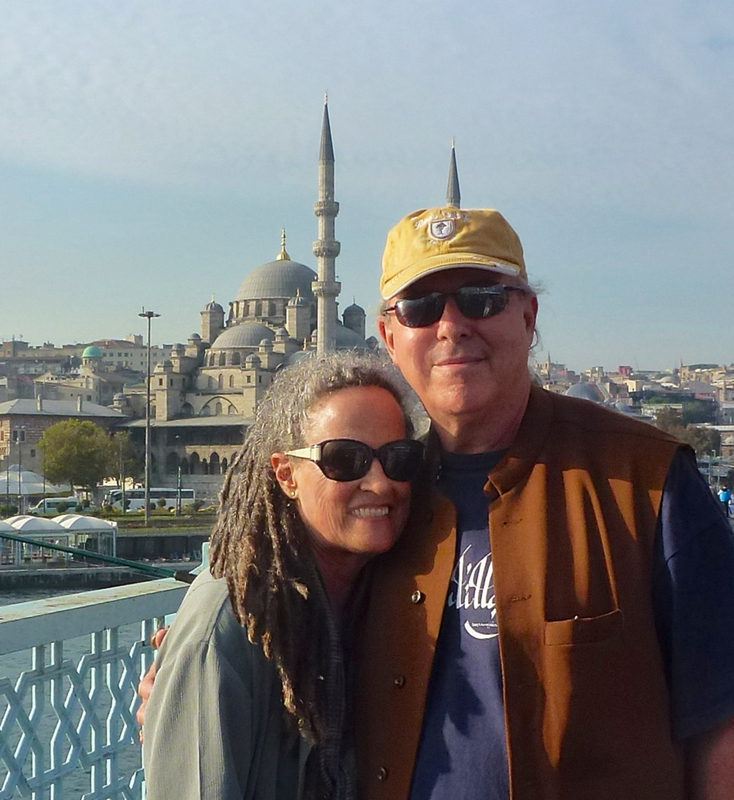 Shabda and I are here in Istanbul, and have been for several days. 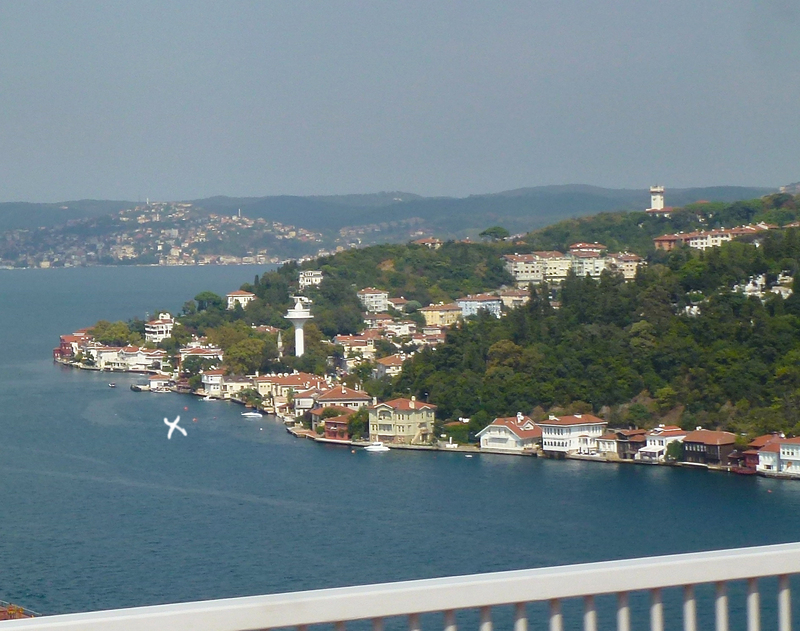 I felt the best way to bring closure to this last appointment our son had made, was to travel up the beautiful waterway that divides the European Continent and Asia – the Bosphorus. We were with our UK friends, Cinda and Tansen, and wanted to make a comfortable day of it, which meant taking the boat as far north as it ran, then taking a taxi back to the city in the afternoon. We began by catching a 10:30 boat, which was quite full, as it was sunny and warm after days of showers. It departs daily from the Golden horn, a kind of inlet in the heart of Istanbul, then joins a remarkable kind of river, known as the Bosphorus, on its way to the Black Sea. In the course of thirty-some miles, this salt channel passes under two suspension bridges. As we traveled back and forth between the European and Asian sides, the river became a clearer blue, the shoreline went from a continual urban landscape to villages, and finally, up closer to the entrance to the Black Sea, wooded mountainous countryside. Just past the second bridge, an hour into the cruise, I knew it was the right moment. I pulled out a photo of Solomon and Nicole taken in our backyard, their eyes the same color as the water. 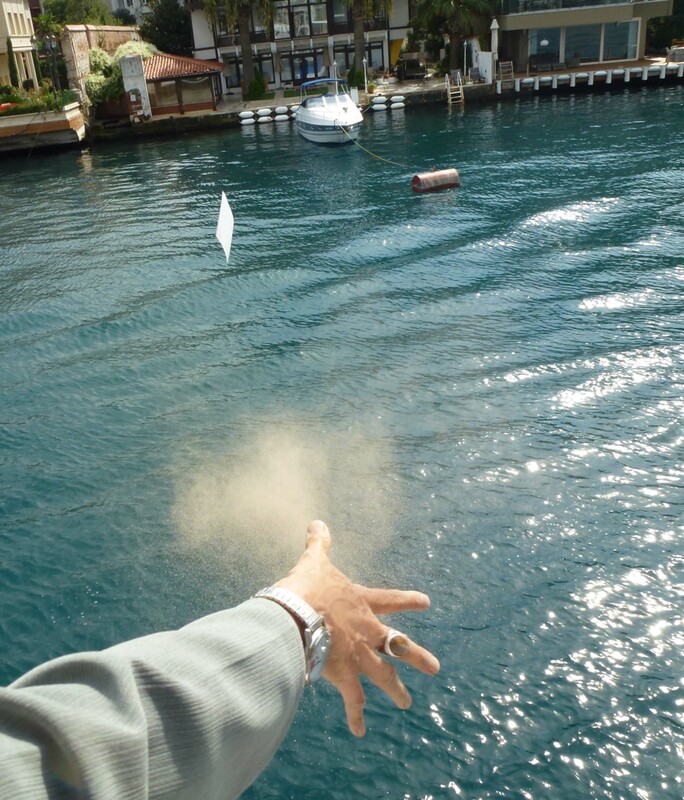 I held it over the side of the boat with some of Solomon’s ashes. In front of the beautiful village of Kanlica (pronounced Kahn-li-ja) I let the photo and the ashes go. It’s amazing how a small ritual like this can bring a feeling of ease, of completion to the ragged heartache of the day. OK, the moment seemed to say, you can let go of this wedding that was not meant to be, let go of this and return to present time. Here in this beautiful place on earth, on the water with a light breeze on a sunny autumn day in Turkey, I’ve done what I came here to do. The next couple of stops brought us into an even more peaceful location. Finally the boat stopped at the fishing village of Beykoz – the end of the line. Shabda led us to the Baba Restaurant where we sat at a table right next to the water, the clear sea-blue water. It was so peaceful after some days in the city of 18 million people. The quiet was like a strong presence. We ordered and ate delicious fresh Sea Bass and another local fish, Dorado, cooked to perfection. Here was the perfect company. The perfect food. The perfect day. Very much like a day with Solomon. This cruise and lunch and easy time with friends. Yet I imagine he’d have rented a fast boat and would return at evening, passing under the second bridge, the one with a thousand bright purple lights lit like the Golden Gate Bridge. 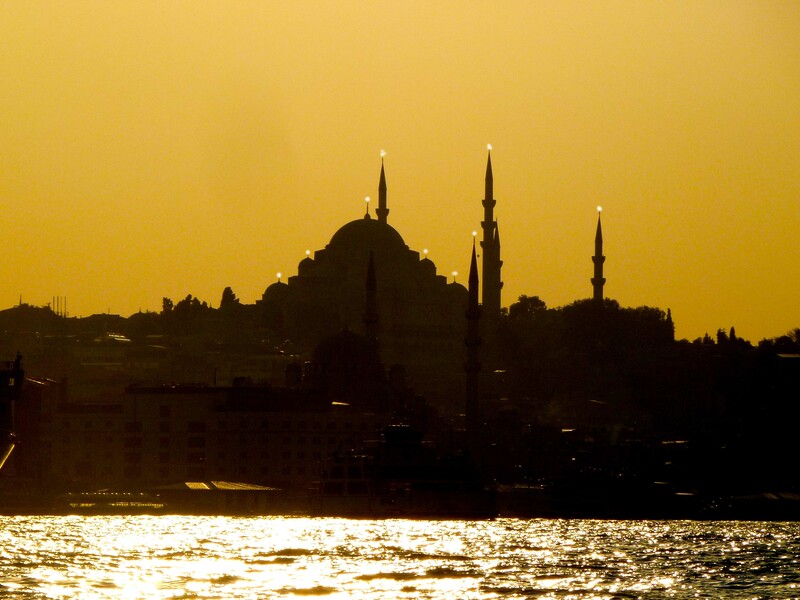 He would would enter the harbor and see the Blue Mosque and Hagia Sophia glowing on the hill. After docking the boat he, Nicole, and his family and friends would take the short ride up the steep tunnel tram to the top of the hill where he would be scheduled to spin at one of the dance clubs on the night streets near Tunnel Square. Losing a child is a heartbreak, but Solomon always did his best to make the best of any situation. His harmonious life continues to shine in all of us. My heart is with you. What a beautiful ritual, beautiful day. Solomon’s love continues to radiate. Yes, it really does! Thanks Wendy. Beautiful! Good to hear from you…. Beautiful telling, beautiful images of this journey up the Bosphorus with memories, ashes and aloha. The power of the rituals was strong – the color of the water like the color of Solomon and Nicole’s eyes in the photo you released…breathing and releasing….and your descriptions of the sumptuous meal you shared while sitting by the water – savoring this moment and it’s offerings……my heart is with you, beloved sister. On the night of the 20th, I played a show with DJ Drez and some other musicians. I had never played as the bass player with a DJ before. It was really cool! I was so thinking of Solomon and feeling his love and groove!! Hugs to you, dear one. Vaya con Dios, Allah and all Spirit. And Shanna Tova! Love to you, Tamam & Shabda, Solomon & Nicole. May Solomon’s memory be a blessing. Solomon, Nicole and you were on my mind and in my heart that day. I’m glad you had the chance to let go some more.. Miss you! Such a tender, touching, beautiful celebration of your beloved, Solomon. Thank you, dear Tamam, for sharing it. Dear Tamam, early Saturday, sitting with Kiran Rana singing Qawwali songs, I suddenly felt you and Shabda in my heart, heard Solomon’s name ringing in my heart ears… and I sang ever more deeply for hearing that and now I feel I was hearing some echo from the Bosporos. Thank you for sharing this beautiful ritual, and your heart as you have always done.